A birthday: eagerly anticipated celebration… for you, shadowed with anguish. The moment God gave you to the world… the moment the most important person in your life turned her back on every natural instinct and walked away. You are moody and irritable in early March, even as you eagerly count down the days. Normal ups and downs of adolescent angst? Or subterranean memories pressing into current emotions? A tiny, squalling body, or perhaps weakly silent, strives to survive. The only other person present in that moment disappears. Eyes, blind with searing sun or perhaps suffocating darkness, staring only into void. Trembling new skin, aching to be cradled by soft skin of another, shoved into crackling, rotting nothingness. Whimpers, meant to move the universe, swallowed by empty sky. An anniversary meant for rejoicing, for you also the commemoration of inconceivable rejection and vulnerability. A day that marks the hi-jacking of your identity and sense of security, and also the pure unadulterated delight of a birthday. This day always haunted by questions: Who was she? Where is she now? Does she think of you on this day? When you were younger, I seethed through a season of anger. I nuzzled your fuzzy head with my chin; and my heart ached with unanswerable questions, How could anyone do that to you? Then, as I spent time in the place you were born, I realized only extreme suffering, physical or mental, could negate the intrinsic drive of a new mother to nurture and protect – desperation all too plentiful in a third world slum. Perhaps she was raped, starving, or herself discarded. Perhaps she believed death the better option for you than the life she endured. I will never understand. But I learned to forgive. I also have no doubt that on the day you were born, there was more than you could see or touch – a third, unseen Presence. A situation so inconceivable that Scripture phrases it as a rhetorical question, an impossibility. Yet for you, it happened. As you awake today, eyes fluttering, I launch your morning: “Happy birthday!” That precious grin I can never see too often illuminates your face with evidence of a new story-line. The old story will always be part of you. Perhaps for the rest of your life you will feel strangely moody in early March as your subconscious struggles to make sense of what never will. Yet slowly but surely you grasp an invisible plot development, as real as the air that filled your fragile lungs on that first forsaken day. An unknown passerby, (human or angel we will never know), perceives the shallow cry or subtle movement, stops, kneels – puzzled. Perhaps a sharp intake of breath in disbelief and alarm, cradles your tender body. A stranger triggered a trajectory of events, and ultimately the God of the Universe birthed you into our hearts half a world away. Even though He called me to the incredible privilege of cherishing you as your adoptive mother, I hold no illusions. Though I savor the honor of making your birthdays as special as I possibly can, of affirming again and again your beloved-ness, I know to Whom you truly belong. From your very first breath, God made you a witness to the peoples. Today, on your birthday especially, remember that you are his beloved. As are we all. But you, you are a living parable. Though the inconceivable should shatter what should be, though a mother abandon her newborn, He will never forget. He inscribed your name on the palm of his hand. He will move heaven and earth to claim you as His very own. 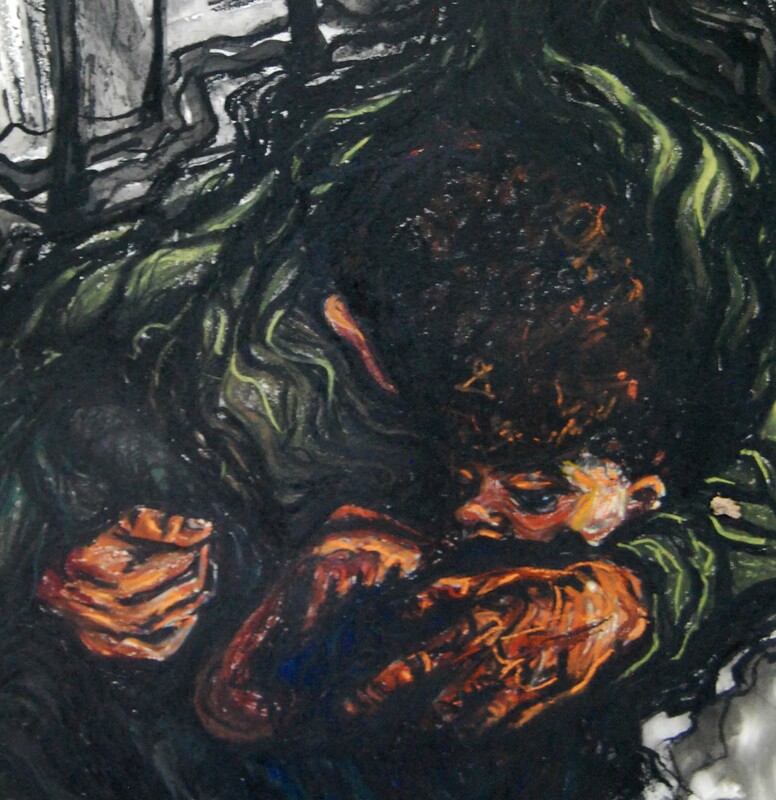 Rescue, 2010, detail; mixed media: charcoal, ink, pastel. Your words have a powerful effect, and your reminder of the words from Isaiah connects us all. I’m so glad it could encourage you! Thank you for visiting! Love this. Living this. Thanks for walking the same journey with such beauty, even when it’s hard. Once again your artwork and words take me to deep places. My oldest brother is adopted. I can’t imagine our family without him but there were definitely years of struggle for him which the rest of us could never quite comprehend. Thank you for bringing more insight to this often difficult place of rejection from one vs. being so loved by another. Blessings!! Yes, I can only imagine the processing your brother needed to do to come to terms with what happened. I am glad he is in your family. You are so encouraging Jody! Every time I visit your blog, my spirits are lifted. I’m so glad to have “met” you! 🙂 When/if I ever move to CO we’ll have to meet in person! 🙂 Blessings!